“Lock her up” was a common chant on the Trump campaign trail, but in less than a month of Trump’s longshot victory, that promise was shredded by the president-elect. In an interview with the New York Times two weeks after Election Day, Trump expressed concern about how much Hillary Clinton had suffered. Breitbart News criticized Trump’s U-turn at the time, calling it a “Broken Promise” on the site’s front-page. But while many of his supporters were indeed disappointed, the controversy quickly died down — with some believing that it was a necessary political price to pay in order to push forward with Trump’s pro-America agenda. Trump’s base reasoned that they would rather have a border wall than Hillary Clinton prosecuted. But now they may end up with neither. For Sessions represents one of the vital pillars of Trump’s immigration agenda. Sessions has fought in the trenches for a tough line on immigration for years, back when Trump was pouring money into the campaign coffers of Democrats who wanted to open up America’s borders. “‘Immigration reform’ may be the single most abused phrase in the English language. It has become a legislative honorific almost exclusively reserved for proposals which benefit everyone but actual American citizens,” he wrote in a 2015 immigration handbook he delivered to all Republican members of Congress. Sessions also represents some of the most significant achievements of Trump’s young administration. The Department of Justice has been fighting to get Trump’s popular travel ban through the liberal courts — a battle it looks likely to win via the Supreme Court. Sessions’ office has also taken a tougher line on criminals by enforcing mandatory minimums and cracking down on street gangs, as well as upping the number of judges at the border. 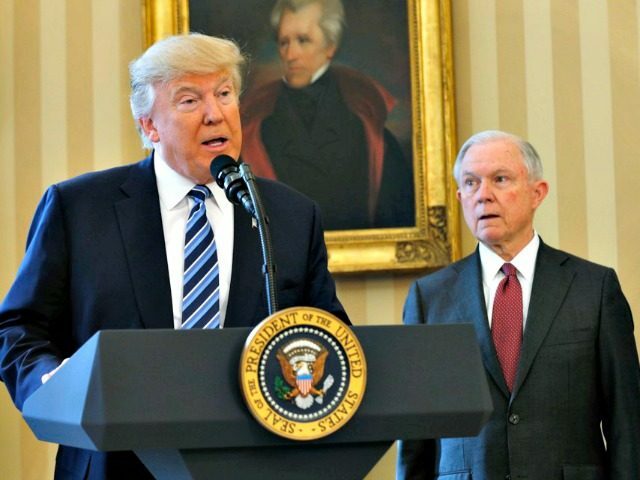 Sessions has also spooked liberal mayors with his promise to push hard against sanctuary cities, forcing cities such as New York City to outline how they are (or are not) in compliance with federal immigration law or else lose their much-needed federal funding. Should Sessions be forced out, it is rumored that Rudy Giuliani — who once said “Some of the hardest-working and most productive people in [New York City] are undocumented aliens” — could be in line to replace him. Another candidate could be Sen. Ted Cruz (R-TX), who would do more to allay the fears of Trump’s base.